Since the BJP government came into power in 2014, it has initiated and purposed to make legislation on Muslim women mainly around the instant Triple talaq. Just a few days back, the Bill was passed in the Lok Sabha where the BJP has a majority. However, the opposition parties belonging to the Left, Congress and Muslims political parties (AIMIM) led by Asaduddin Owaisi, vehemently opposed the move in the parliament and fiercely argued that this Bill in current forms and contents is not going to provide justice to the Muslim women as often argued by the BJP leaders. For opposition parties, the purpose of the government is to create a divide between Muslim men and women by criminalising Muslim men and demanding the punishment for three years. Owaisi, Congress leaders and CPM leaders like MP Salim in the Parliament have argued that the current Bill in the present forms is against the principles of equality, cultural freedom, legal pluralism and the basic tenets of the Indian constitution. Despite the opposition, the Bill has been passed by the Lok Sabha and now the BJP has introduced the Bill in the Rajya Sabha on 31 December 2018, however, amid uproar the said opposition parties have boycotted and walked out from the parliament. In this article, I am not going to discuss the legal and theological discourse around the said Bill; legal experts and Islamic scholars have earlier written and highlighted the limitations of this particular Bill. Here, I am mainly concerned about the ‘public discourse’ which has been created by the Hindu Nationalist forces with respect to gender justice and minority rights including the idea of ‘legal pluralism’. In doing so, I argue that the stand taken by the so-called conservative corporate-owned media and communal forces is guided by the political motive and ‘discipline’ (criminalizing) the Muslim male community rather than providing justice and equality to the Muslim women. The BJP-RSS and even some section of the so-called liberal intelligentsia think that there is an inevitable tension between community rights and norms of gender equality and individual women freedom as seen in the famous and controversial Shah Bano case in 1986. At that time, acrimonious debates took place and opinions were sharply polarized on communal and gender lines. Some sections liberal and right-wing forces had noted that the tension between the community rights/minority rights and gender justice were in fact irreconcilable. The fact cannot be ignored that certain section of conservatives and fundamentalist forces within the Muslim community have had strongly opposed the Supreme Court verdict given in the case of Shah Bano (a divorced woman, 70 years old). As a result, then the Prime Minister Rajiv Gandhi succumbed to the pressure of the Muslim conservative forces and the Muslim women (Protection of Rights on Divorce Act -1986) was passed by the then Parliament to overrule the Supreme Court verdict and exempted from the 125 of Indian Criminal Procedure Code (under this section, provisions are made to provide maintenance by the ex-husband till divorced women get remarriage). In this respect, most of the political theorists and feminist scholars have argued that ‘illiberal’ community practices and patriarchal norms could not be justified when it violates and infringed the ‘individual freedom’ as happened in the case of Shah Bano. The critique of the then the Rajiv Gandhi’s government had been done by feminists and others liberal intelligentsia on the ground of ‘gender justice’ and individual freedom. It is interesting to note that stand taken by secularists, feminists at that time were similar to that of the Hindu nationalist forces with respect to opposing the Rajiv Gandhi’s government stand on gender justice. It is crucial to note that under the pretext of gender justice, the BJP-RSS put-forward the agenda of Uniform Civil code and said that the Congress acting as a ‘pseudo-secular’ party and promoting the ‘politics of appeasement’. Still, the BJP and RSS maintain earlier position with regards to Muslim community rights. That is why communal forces have never accepted the Sachar committee report (SCR; 2006) which has also underlined the pathetic conditions about Muslim Women. I have in the past argued that SCR was not for only the Muslim community alone, if one could read SCR recommendations holistically, it could be safely argued that agenda of SCR is based on ‘Idea of Inclusive’ India as often said by Prof. Amitabh Kundu, former Professor at JNU. It is relevant to underline here what Dr Ambedkar had said about the minority rights long ago, the need to remember in the age of Hindutva, ‘every minority, irrespective of any other consideration, is entitled to the right to use their language, script and culture and right not be precluded from establishing any educational institution that they wish to establish’. (Cited by Prof. Rajeev Bhargava, ‘Muslim Personal Law and the Majority-Minority Syndrome’ in his book ’The Promises to India’s secular Democracy, OUP, New Delhi, 2010, p- 159). In the given political context, to maintain the distance from the Hindutva forces, feminist and secularists and others liberal-minded scholars have now slightly changed their position and stand (which was taken during the Shah Bano case-1986) for pushing the ‘reform from within’ as for as the Muslim Personal laws (MPL) and gender justice are concern. In this respect, an eminent political theorist, Prof. Rajeev Bhargava and former Director of CSDS and others have taken the position that ‘Democratic state’ should provide ‘liberal conditions’ to push the agenda of ‘internal reform’ within community, so that the norms of gender equality and freedom could not be violated (See Prof. Bhargava, p-161). However, for progressive sections right to ‘exist’ from the community for male or female individuals could not be bypassed as enshrined in our secular Constitution. A certain section of orthodox clerics has interpreted Islam in a very patriarchal manner and continue to have a ‘medievalist mentality’ on the gender question. While doing so, conservatives (mainly the upper-caste Muslims male) have undermined the norms of gender equality and more importantly, the right to Muslim women and their agency to access the rights and opportunities, incorporated in the Indian constitutions and even enshrined in the Quran as underlined by the Muslim women social activists and the Bharatiya Muslim Mahila Andolan, an umbrella organisation of Muslim women at the the national level. Besides, noted Islamic scholar like Asghar Ali Engineer and some Islamic feminist Asma Barlas, Amana Wadud have consistently argued that in the Islam there are enough provisions for ‘gender equality’. However, conservative Mullahs have interpreted ‘Islamic theology from the established patriarchal norms in a society like India, and, in fact, not treated Muslim women equally vis-a-vis Muslim men in spite of ‘egalitarian norms’ prevalent in the early Islamic theology. In this respect, many fatwas have been given by the orthodox religious scholars to maintain the ‘status-quo’ and established patriarchal norms in societies. In short, it could be said that due to the conservative interpretations of Islamic Sharia as said earlier, it appears that community rights (mainly those rights which are based on illiberal values) and norms of gender equality could not be reconciled easily. However, one the basis of progressive and egalitarian interpretations of ‘Islamic theology’ as done by Engineer and Islamic feminists noted earlier, one could argue that nowhere it has been mentioned in the Quranic Text that Muslim women have a lower ‘social status’ in compare to Muslim men. In short, keeping the arguments of egalitarian values of Islam in mind, if community rights and gender justice interpreted and seen from the lens of these progressive values, there will be no conflict between community rights and gender justice and hence, both kind of rights are not incompatible to each other, which the BJP leaders never paid attention who claim to be now sole guardian of gender justice. It can be safely argued that community rights/minority rights, and gender justice as enshrined in our secular Constitution is not fundamentally opposed to each other, as the leaders of the BJP have deliberately put-forward in the public domain. The fact must be underlined that the stand of the RSS-BJP combined (as also propagated by the western media and orientalist scholars) on the incompatibility of community rights and gender justice with respect to Indian Muslims and Islamic sharia were always replete with communal bias and politically motivated rather than the based on norms of gender justice and concern for larger humanity as often said by the BJP leaders in the public domain. “Uniform Civil Code” has nothing to do at all with gender justice. It has entirely to do with a Hindu nationalist agenda and is right up there with the beef ban and the temple in Ayodhya. A Uniform Civil Code is meant to discipline Muslims, teach them (if they didn’t know it already) that they are second-class citizens, and that they live at the mercy of “the national race” (the Hindus), as M.S. Golwalkar decreed. (See. The Hindu, 15 July 2016). 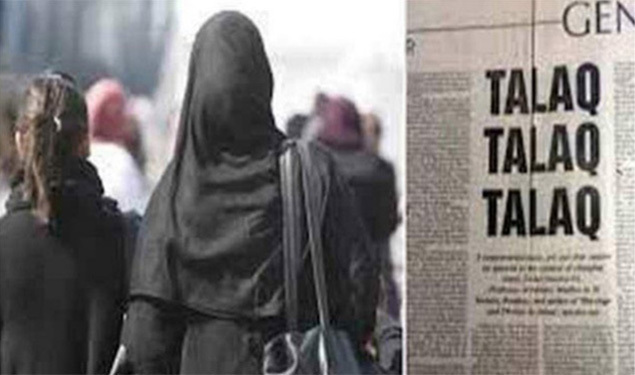 In short, on the basis of earlier points made by scholars belonging to different shades of thinking, her, it is argued that recent move like instant ‘Triple talaq Bill’ as put forth by the BJP government is not based on ensuring and providing the ‘gender justice’ for the Muslim women but rather to ‘discipline’ and criminalize the entire Muslim community. The Author is a PhD candidate at the Department of Political Science, University of Delhi.